Most Radio Remote Control applications are built around one of our Core Products. For specialized applications, we have engineered our core systems with specific features to meet these requirements. Cattron-Theimeg is the world leader in design, manufacture, installation and service of Industrial Portable Radio Remote Controls for overhead crane and general material handling applications. Multi-Processor, top-of-the-line system with up to 48 inputs and 96 outputs. The MP96 series offers the safety and dependability required for operating machinery in harsh industrial environments. The MP 96 represents the “top of the line” offering the safety and dependability required for operating machinery in harsh, industrial environments. The “MP” stands for “Multi-Processor” which means more power and configuration possibilities. • Suitable for hydraulic, VFD, pneumatic, electrical, automated and semi-automated control system applications. “Advanced Technology” and high performance with up to 32 outputs at an affordable price. The Cattron-Theimeg AT Series offer the safety and dependability required for operating machinery in harsh, industrial environments. AT Series Systems can be installed on overhead cranes; furnace doors; conveyors, shiploading equipment, mining machinery, agricultural equipment; and much more. All Cattron-Theimeg AT Series Systems are custom engineered to meet individual application needs, and can be engineered for up to 32 outputs and/or stepless. The AT-S is a pre-engineered version offering faster delivery and all the advantages of the standard AT without the need for an FCC or DOC license. Check with your Cattron-Theimeg representative for complete details. All receiver/decoder units (shown above) used with the AT are high quality, industrial units which are housed in compact NEMA 12 (IP 65) enclosures. The AT utilizes high-performance microprocessors with a minimum number of components. A single board receiver/decoder responds to the direct control of a rugged, hand-held controller/transmitter. The entire electronics portion of the receiver/decoder is protected with an EMI/RFI shielded sub-chassis (gold box). This compartmentalized chassis contains the power supply, the RF receiver, and the microprocessor-based decoder. AT Series systems are available with options such as Close Start™, Range Limiting™, and Multi-Frequency Using Synthesis. Multiple microprocessors prevent undesired signals from entering the decoder, thereby improving operation and reliability. AT decoders incorporate extensive self-diagnostics which perform on a continuous basis to insure reliable and safe operation. A two character status display shows both normal running status and any fault conditions. Outputs are connected to the relay interface via a single ribbon cable. Long-life electromechanical relays are organized for easy function recognition. All relays plug into sockets with mechanical hold-down screws and snubber circuits are provided for inductive loads. LED's located beside each relay show, at a glance, when it is energized. Cattron-Theimeg application engineers ensure that all AT receiver/decoders are programmable. This allows for complex sequential logic, function timing, interlock, etc., to be built-in, often eliminating the need for a second interface, such as a PLC with timers and latching relays. Because the AT is programmable, they can be adapted to a wide variety of equipment. AT systems will also work with several different Cattron-Theimeg controller/transmitter styles. "Off-the-shelf" product that is "EZ" to install, "EZ" to maintain, and "EZ" on your budget. The EZ also does not require an operating license. The Cattron EZ Product Group provides industry with a high performance, low cost, Portable Radio Remote Control (PRRC) alternative. The EZ System is an "off-the-shelf" product line that is "EZ" to install, "EZ" to maintain, and "EZ" on your budget. 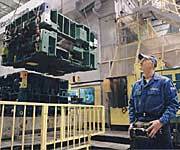 The EZ System is for use on overhead cranes, furnace doors, conveyors, and much more. The EZ does not require an operating license and can be easily installed and ready for use at the job site in a relatively short period of time. All EZ models are microcomputer-based, have high digital message security, and employ both system address and BCH error detection to assure safe, reliable control even in harsh, industrial environments. The EZ system is comprised of two primary components: a receiver/decoder and a choice of either Cattron-Theimeg's MK or PS controller / transmitters. The receiving and decoding hardware and the relay interface are contained within a compact, NEMA 12, IP65 steel enclosure. The receiver/decoder and power supply circuit boards are housed in a sub-chassis which provides EMI shielding and isolation from the output relay interface. The sub-chassis also provides an "EZ" way to change all of the electronics should a repair be required. The decoder makes extensive use of the microcomputer's self-diagnostic capabilities by using a two character display to show system status. The output interface to the machine is handled by plug-in relays rated for heavy industrial loads, both resistive and inductive. Each relay has two screw terminals, an output fuse, and an LED indicator showing when it is energized. A secondary contact on each relay is used by the decoder to sense and verify each of the radio transmitter commands. Should a fault condition be detected, the operator relay and all outputs will be disabled. Automatic Safety Override (ASO) is a safety feature in most Cattron-Theimeg Systems. “Crane Specific” system designed to be ready for use right "off-the-shelf". The CS is perfect for overhead cranes and other types of machinery with reversing motors. The Cattron-Theimeg CS (Crane Specific) system provides industry with a high performance, low-cost digital Portable Radio Remote Control (PRRC) alternative. The CS system is a low-cost product that is easy to install and maintain. Designed to be ready for use right "off-the-shelf", the CS is perfect for overhead cranes and other types of machinery with reversing motors. It does not require an operating license and can be easily installed and ready for use at the job site in a relatively short period of time. The CS System offers the end user up to 65,000 different addresses; thus, the chance for duplicate operating addresses is minimal to none. In addition, the CS offers "Output Relay Interlocking." This feature insures that the directional relays are interlocked to allow only one closure at a time, e.g., Forward or Reverse. The CS System is comprised of two primary components: a receiver/decoder with relay interface and a choice of either Cattron-Theimeg's MK or PS controller / transmitters. The receiver/decoder and output relays are all laid out on a single circuit board housed within a compact, NEMA 12, IP65 steel enclosure. The single board design provides a simple way to change all of the electronics should a repair be required. The decoder makes extensive use of the microcomputer's self-diagnostic capabilities by using a two character display to show system status. The output relays are rated for heavy industrial loads, both resistive and inductive. A secondary contact on each directional relay is used by the decoder to sense and verify each of the radio transmitter commands. Should a fault condition be detected in the directional relays, the OPR and all motion outputs will be disabled. Automatic Safety Override (ASO) is a safety feature in most Cattron-Theimeg systems. NOTE: OPR connects to the mainline contactor. 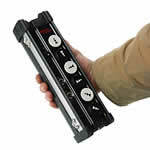 Certain Cattron-Theimeg radio remote control systems offer a choice of controller styles. Each style is built with worldclass quality and designed to withstand harsh industrial environments. Choose a style below for more details. Toggle Type - Available on MP, AT and AT-S systems. Paddle Type - Available on MP, AT and AT-S systems. Joystick Type - Available on MP, AT and AT-S systems. MK (Metal Keypad) - Available on MP, AT, AT-S, CS and EZ systems. PS (Pendant Station) - Available on MP, AT, AT-S, CS and EZ systems.